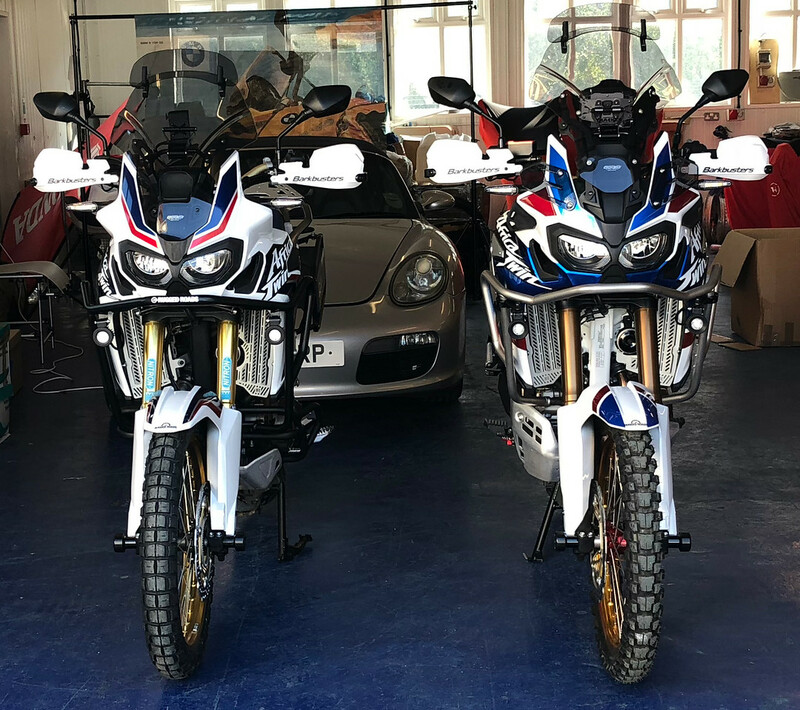 I'm going to get my new MY2018 european Africa Twin DCT in a couple of days. I'll put on it some 3rd party aux light and trying to figure out how to wire them. I know the AT has an accessory connector behind the instrument cluster, and I know Honda provides a specific harness to "double" the socket in case both the 12v socket AND the aux lights are installed (like in my case). However it looks, from the Honda website, that the harness is compatible with AT model year up to 2017, not 2018. For the AT MY2018 no harness is available, so it looks like Honda decided to provide two different accessory connectors for 12V socket and aux lights, removing the need of the duplicating harness. Is this true? Am I thinking correctly? Is there anyone, hopefully in Europe, who can confirm this (on MY2018)? Having been down this road with my ATAS, speaking directly about the ATAS, the accessory cigarette power socket plug is now powered from the wiring harness, so it doesn’t use the power plug behind the instruments. What I have done, is bought the Y accessory cable, plugged it into the plug behind the instruments and used that for my gps and additional wiring for my Denali D2’s. The new bikes are definitely wired up differently than the 2016/17 bikes, so you can’t use what might have worked on these bike and carry that over to the new 2018 bikes. It’s been a bit of a learning curve, but Jonathan at RR has been very helpful. How much power can we pull from that plug up front on the ATAS Shedracer? Do you know what size fuze it has? Sorry can’t answer that, I’m certainly no expert, when it comes to electrics. All I can say, I have a TomTom 550 powered and a live feed for my Denali D2 switch gear, the actual D2’s are powered from the battery, via an Eastern Beaver 3 circuit solution, so I guess the power consumption from my gps and switch, aren’t a great amount. As I said, Jonathan at RR was a huge help and he would more likely be able to answer your question. All I know, is the new bike has quite a few differences in the wiring harness. When I get time, I’ll add a few photos of how I’ve wired things up, on the new 2018 bike, if your interested. The 2018 models have the 12v Accessory socket plugged into the main loom, completely separate from the front option connector. Or if you just want to add a set of aux lights, you won't need a splitter, you can just power them from the front option connector. zippysworld, Tim Fairless, Travelling man and 5 others like this. Last edited by Jonathan Parke; 06-22-2018 at 09:37 PM. Good job Jonathan, thanks for all the help you gave Hovis and I, fitting our Denali D2’s. Thanks a lot to everybody. Now the wiring situation on my 2018 is much clearer. 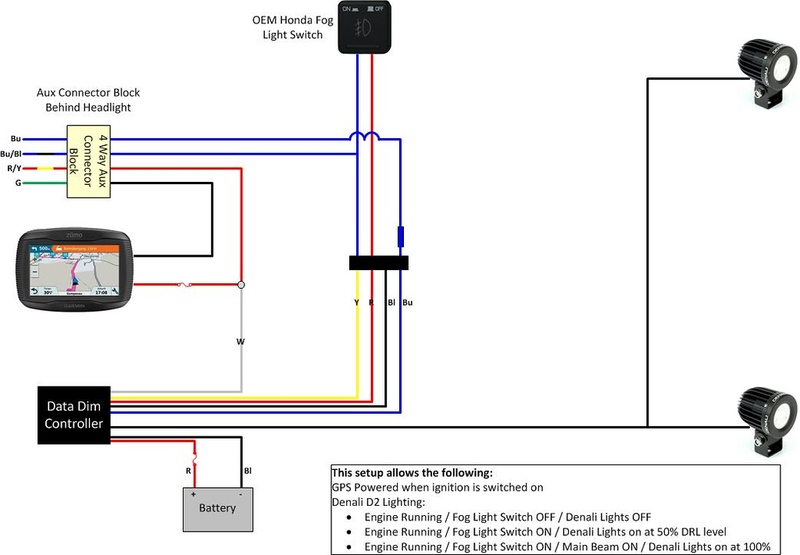 I'll get the harness in order to connect both the GPS and the aux lights. It would be really great to have some pictures of the wiring and especially the connectors. I would like to use the OEM (Sumitomo) connectors but I'm not sure the Honda fog light switch what connector uses. Thanks again! Great forum, by the way! Deltabi, I’ll post some photos either Sunday or Monday. Concerning the Honda fog light switch plugs, I just cut it off and replaced it with something easier to get hold of, rather than try and find the correct type connector. Thanks a lot, I'll wait for the images... I suspect would be easier replace that connector with some AMP Superseal, for example. Hopefully this will help you Deltabi, but also those who may want to connect the Denali lights. First thing I’d like to point out, some of the wire colours are not as expected, I only had a few rolls of wire at home, so used what I had available at the time. I used the Honda OEM “Y” accessory cable, connected it to the ATAS power accessory connector behind the instruments. I also used the OEM connectors for connecting up the cables to the Y cable, all from Jonathan at RR. As can be seen, I also used a single cable Superseal connector and a double superseal connector, for the full beam trigger wire and the Honda OEM fog light switch. 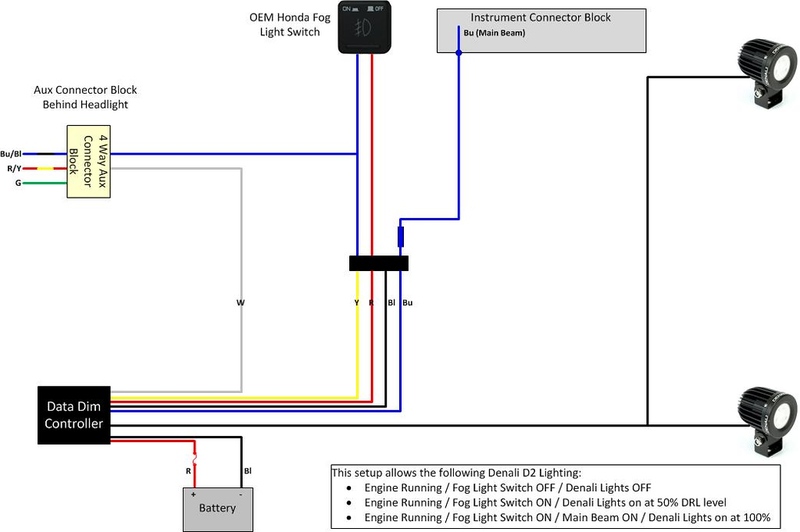 I made my own wire harness for the fog light switch, gps extension cable and the main Denali 3 wire harness, upto the OEM Honda Fog light switch. The new 2018 bikes nolonger have a full beam wire in the power accessory plug behind the instruments, if it had, the wiring solution for the Denali, would of been a lot easier and neater. The new bikes only have a live, earth and a fog light wire, to activate the fog light symbol in the dash, when switched on. I had to find a full beam trigger wire, Jonathan sent me a wiring diagram for the 2016/17 bikes, but this demonstrated the differences in the 2018 bikes over the 2016/17 bikes. I couldn’t find a full beam wire using the 2016/17 wiring diagram, but luckily, after much searching, I eventually found one. Looking at the photos, just above the snorkel tube for the airbox, there are two block connectors, a black one and a grey one, now look up further to the area where the indicator light mounts, there’s a black block connector. I unraveled the plastic protective cover and found a Blue wire, stripped back to the bare wire and soldered on a wire, heat shrank it and put back the protective cover. This was my full beam trigger wire, which I then used a superseal connector, to connect to the Denali wiring harness. (Jonathan has since produce a new wiring diagram for the 2018 bikes). The OEM Honda Fog light switch was used, I cut off the standard plug, and used a superseal connector instead. I also soldered a wire onto the blue wire, to run that upto the Y cable, to activate the fog light symbol in the dash, when the Denali’s are switched on. Jonathan’s new wiring diagrams for the 2018 bikes, was very helpful. I’m a complete novice when it comes to electrics, but I managed to crimp connectors, solder and make my own wiring harnesses, it may not be to a professional standard, but if I can do it, anybody can. Hope this helps anybody that’s thinking of fitting the Y cable, or auxiliary lighting to the 2018 bikes. superfunkomatic, Tim Fairless and deltabi like this. Last edited by Shedracer; 06-24-2018 at 05:05 AM.